When you show up February 3rd in Mystic for the Annual Meeting, be sure to pack your knife, because the finest kind of Cape Cod oysters will be on hand at the Pre-Annual Meeting Musical Gathering. Revenge is an Alden 270(h)that was launched by Britt Bros. in 1926. Revenge was originally launched as "Sea Breeze" and has carried the name "Irma Ann" at some point in her life. Following his practice for the past several years, VERN BRADY's dues renewal check was the first to land in my mailbox. Thank you, Vern. Let his example be an incentive for all of you! Let's work together to make this year ASA's most successful. As announced at the 2005 annual meeting, the ASA is planning a gathering featuring music and good cheer on Friday, Feb. 3, the night before this year's meeting. We decided to have the gathering in the ASA Suite at the Mystic Best Western Inn instead of at the Seaport, as we thought it would be easier for people to attend if they didn't have further transportation to worry about. Whenever you arrive please stop by the suite to say hello, and stay for as long as you wish (we plan to get things going around 1930 hours, and should continue as long as there is interest). We will have some snacks available but feel free to bring along something to wet your whistle ;-) And any of you who are of a musical bent are strongly encouraged to bring your voices and instruments! Tucker Daland one of the founders of the North Haven Maine summer colony, commissioned BB Crowninshield to design a schooner primarily for day sailing. In this design, Crowninshield may have had in mind the lines of his 1906 Dark Harbor 17. Heron was built in Chelsea, Massachusetts in 1911 by R T.Green and Co. and sailed out of North Haven for many years. 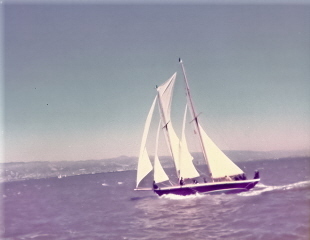 Horace Pettit, MD bought Heron in 1934 and sailed her over a period of 56 years. When I bought Heron, Dr. Pettit was still alive and I was able visit him in a long term care facility. He told me many interesting facts about the boat and recounted some of his experiences sailing her. Happy New Year from Port Townsend Washington!!! I am planning a trip to Maine to catch the Portland Boat Builder show and would like to connect with anyone who has one of these lovely boats. I am currently up to my ears in the restoration of Revenge #270h. New keel timber, floor timbers, frames, planks and a seamingly endless list of other items negatively impacted by 80 years of iron. I would like to visit anyone who may have on of the 270's for reference and general info regarding the restoration I am currently undertaking.